You may remember me talking about my goal of getting off the couch. Well, I've largely succeeded in my goal. I wouldn't say I'm 100% there, but I've definitely improved. I've attended 13 hot yoga classes since my March 11 post. I'm also walking with a co-worker every day at work for 15 minutes (we do 5 laps around the hallway and up the stairs, so a little over a mile). I try to walk for 30 minutes at least one more day during the week. This is where I could step it up a bit, no pun intended. I feel better than I have in a long time. I'm sleeping well, and I have way more energy. I guess it's true what they say, "a body in motion tends to stay in motion." A huge factor in sticking with an exercise regimen is support. If I have to have someone to "report" to about my exercise habits, I'm much more likely to stay with it. It's like I don't want to let that someone down. I want to be able to proudly report that I did, in fact, exercise yesterday. Thanks for asking. Even though I do exercise, I also do some pretty awful things to my body. I fill it with preservatives, refined sugar, and artificial sweeteners almost every day. I deprive it of sleep, subject it to unhealthy amounts of stress, and Lord only knows what my caffeine addiction is doing it. Amazingly enough, regardless of the crappy things I do to myself, my body still performs pretty well for me. I mean it got through a 109 degree 50% humidity 60 minute yoga class with only 500 calories of energy that day. If that's not a miracle, I don't know what is. After that awesome yoga class, I got to thinking. What if I stopped treating my body like a machine and started treating it like the vehicle that will take me through life for the next 60+ years. How well would it perform for me then? 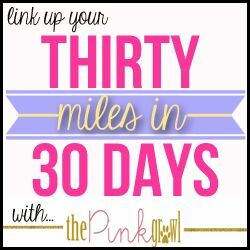 When Nikki decided to host the 30 Miles in 30 Days link-up for April, I knew it was just what I needed to give me a little more motivation. That extra push I need to be kinder to my body. So, I'll be linking up with her each week to share my fitness progress, in miles. The goal is to have logged 30 miles, in some way or another, by the end of April. Here's my week so far, all miles are walking miles. I'm so excited to keep moving and feeling great. What about you? What keeps you motivated to stay fit? You are doing fantastic! I fell in love with yoga this year but I haven't tried a hot yoga class yet. I'm visiting from the 30 Miles challenge; keep it up! 11 miles already! That's fantastic! You've definitely motivated me to kick it up a notch or two! You are waaaay ahead of me sister! We need to walk together sometime on a purdy Knoxville day! I can't wait for the weather this weekend to get in an outside run!